This charming 3 bedroom and 2 bath home is located on a quiet cul-de-sac in a serene setting with amazing nature views and privacy. As you enter the bright foyer with a skylight you are drawn into the open feel of the great room and dining room. The great room features a vaulted ceiling, warm gas log fireplace and inviting conversation area. The formal dining room with vaulted ceiling is a wonderful space for entertaining. French doors between the great room and dining room lead out into a relaxing sunroom with ceiling fans and windows that slide open to screens to help you feel closer to the outdoors. The spacious kitchen features quartz counter tops and beautiful tile backsplash plus an island with a vegetable sink and a pot rack. The breakfast area has a large picture window overlooking the deck and peaceful backyard. Off the kitchen is a multipurpose room that can be used for an office, work space or storage. The master bedroom has a large master bath with whirlpool tub, separate shower, two vanities with quartz counter tops and walk-in closet. There are two additional bedrooms and a hall bath with a tub/shower combination and vanity with quartz counter tops. 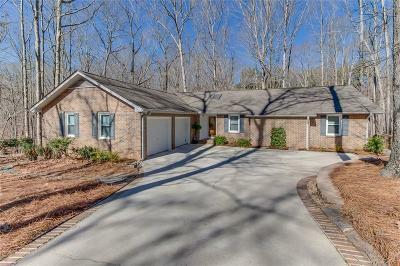 There are beautiful hardwood floors throughout plus ceramic tile baths and warm cozy carpet in the master bedroom. There is a large deck off the sunroom overlooking the private wooded backyard. There is also a double garage with large storage room, ample storage under the house and an irrigation system for the shrubbery that completes this exceptional home.